Can you read this message? Of course you can’t! That’s because it’s written in a secret code. One created by my very own little secret agent. 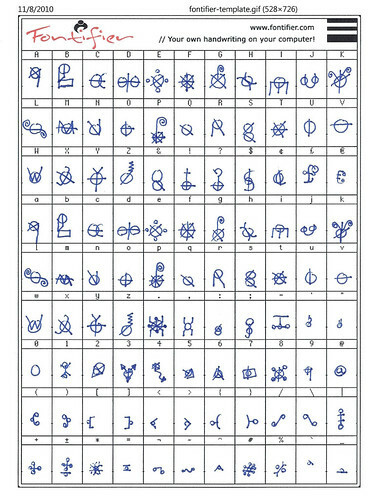 The problem is, writing coded messages by hand takes a loooong time. But yesterday, he had a brilliant idea: “Dad, let’s create a special font so I can just type my messages in on the computer and print them out.” Yeah, that would be awesome! Then he could crank out tons of secret messages! How the heck did he come up with that idea? And, how do you pull it off anyway? A while back, I stumbled upon a site called Fontifier that let’s you turn your handwriting into a custom font. Then you can install your custom font on your PC or Mac and use it in your favorite writing and drawing programs. Really cool. The steps are straightforward — download a template, fill it in, scan it, and upload the scanned image. Fontifier will show you a preview of your font right there in your browser. If you like it, you can pay 9 bucks to download the custom font file, which you can then install on your computer. The steps are all well documented on the site. Also, here’s an old review on lifehacker.com with some good tips. By the way, I highly recommend creating a custom font out of your youngster’s handwriting as well. It’s a wonderful way to capture some memories, and it’s fun for writing notes to grandma and grandpa, making custom cards, making custom T-Shirts (here’s one of my favorite examples) and any number of other digital art projects. Your little secret agent is very thoughtful with his message he posted: Bless our Veterans. How appropriate today. The secret message has reminded me how thankful I am to all our heroes who fought for our freedoms. Two of these heroes are my grandfathers - who I am sure are smiling down on your little secret agent for reminding us. what the heck is a veferans? Oh! Veterans! My code cracking skills are a bit rusty. :-) cool idea! I'm going to try it tonight! Kids will love it. Yeah, the "f" and the "t" are pretty darn close! 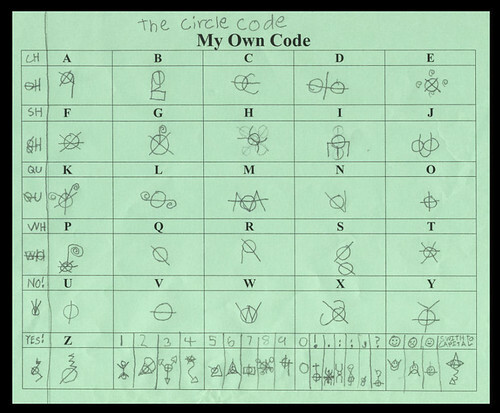 Maybe you can post a flickr link to your kid's code and/or handwriting fonts - would be fun to get a gallery going. That's a cool idea, Bill! It's funny because I had a client ask if there was a tool like this out there and I didn't know of any at the time. Thanks for sharing! Looks like a neat thing to try out with my little ones. I remember doing it myself in the pre-internet days of 1981! I hope you're able to try it out. If so, come back and post a flickr link to a coded message and we'll see if my 8 year old can crack it!